Marco Sodini, our expert, brings us a deep analysis about the relation between home-grown players and the market laws. The evolution of professionalism, increasing globalization, changing regulations governing European Championship formulas has undoubtedly led to some consequences related to the game, the way to build teams and developing players trained in different countries. In 1995 in Italy each team had a maximum of only two foreign players. In 2010, the Virtus Bologna (NdR, the team I coached) had 8 foreigners out of 12 (eg Brett Blizzard, with Italian passport, was an American by birth and by training skills). In just 15 years the number ratio between Italian and foreign players in a roster has been reversed. Besides this, the diffusion of scouting services and the presence of the Internet in globalization of the game and teaching have profoundly changed the way in building and managing teams. Let's analyze some aspects of this change. The history of the Italian championship has been a history made of great cycles. In the 50s, Olimpia Milano wins eight titles in 10 years, the great Ignis Varese earn 5 seasons out of 6 in the late 60s, in the 80s Milano wins 4 titles of 6 and Virtus Bologna again three in a row at the beginning of the 90s. The last winning streak was that of Siena with seven titles in a row from 2006 to 2013, however Siena deserves a separate discourse. The reason of the repeated wins relies almost always the maintenance of the team's structure. Seven, eight, nine players remained with the team in the same club for many seasons. They had a way to grow and improve and helping new players to enter in a game system already consolidated. These coaches were able to build their own model of basketball, allowing the group itself to consolidate. Similarly, the young player had the time of insertion, increasing its own technical background already involved in a high-level context. The opportunity to play, if the commitment and quality of work were constant, was evident. In that period in European basketball, national connotation was well defined. It was definitely recognizable (and differentiable) a player raised in the Italian school that one who came from Slavic or Russian schools, for example. The global market and the large number of players from different educational and cultural experiences, indeed imposed coaches need to predispose a gaming system, streamlined and effective as possible in the shortest time. Furthermore, market developments have also occurred in fact, sudden changes in the teams, roster replacements on the fly, and clubs rarely ever have the time to wait for building and consolidating a working group. Likewise, players have less patience to stay and work in the same place for several years, as they tend to go for technical or economic situations that make them take a quality leap as quickly as possible. One consequence of this was the depersonalization of the European way of playing. All nations have a tendency to unify its model of the game and therefore, what was previously a clear distinction between players of different nationalities it has been lost. A second consequence was the formation of less home-grown players: no patience for youth development, and subsequent the decrement of international quality players produced in the territory. A major problem with respect to this issue is also related to the training of young players. The need to prioritize the team's development team, through the improvement of the workforce, and knowledge of the duty to comply with the continued demand for short-term results, often are given the option to ignore the elements of personal development that are necessary for the formation of a young man on behalf of those aspects of the game that could be immediately used by the group in terms of immediate results. 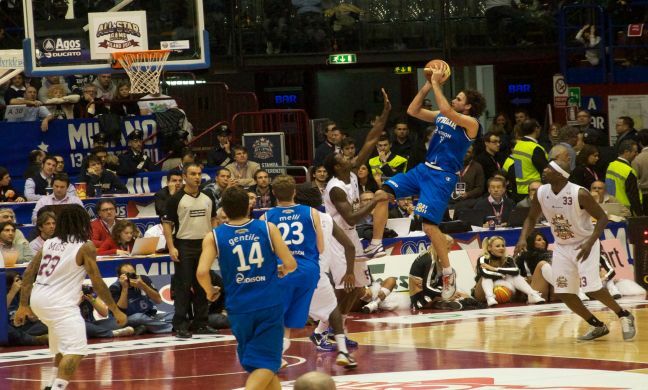 If players very high level (Gallinari, Belinelli, Da Tome, Bargnani, Gentile, Aradori, etc.) have had relative difficulties concerning his immediate productivity for their respective teams, for players of discrete level this situation will lead to a slower development of their own potential and the consequent fall in the average technical level of players. While the Federazione Italiana Pallacanestro is trying to address this deficit with a highly rated program radically inserted in the Italian territory and implementing it (putting emphasis) at all age ranges and in all categories from the younger ones, developing highest quality projects, entrusted to technical high quality coaches (Andrea Capobianco for example), it is also true that even with an increase in the results of the youth national teams at international level, it doesn't reflect properly in a corresponding increase in the use of young Italian players at club level. A notable example is the victory in the European Under-20 Championships in 2013 and the low utilization of these same players in the Italian league, while in other countries, at 16-17 years old, young players are protagonists of their own senior championships. In conclusion, the historical moment and the choice of the globalization of basketball has led to different consequences, as in all things, some positive and some less positive. If the production of quality players is considered an asset to cultivate a basketball momentum, my opinion is, in addition to an effort to provide technical training in high level, it must represent then a canal that opens opportunities of expression for young players, because without confrontation at a high level (up to a certain limit), no improvement can be demonstrated, and if there is no opportunities there won't be improvement at all.